black steven – Professor A.L.I. If any moment validated what I do as a poet and artist, it was speaking with Lord Jamar of Brand Nubian over the phone about the track I’d just sent him and my concept for it. Anyone who knows me, knows that Brand Nubian, and in particular Lord J, with his lyrical content, voice, and spirituality had a profound influence on me as an artist and as a Muslim. I remember playing Claimin’ I’m a Criminal on repeat, over and over again as a college student—Lord J’s and also Sadat X’s lyrics spoke to me on both an experiential and existential level. Here were two black men, who embraced their identity and did not wear masks. From time to time I’ll ‘check’ for Lord J, and I always appreciated how sincerely he ‘repped’ his faith and identity in all the forms of artistic expression. It’s something I sought to do in my artistry as well, and found in Lord J a model to emulate. So for all these reasons, talking to Lord J was a bit surreal for me. However the conversation surprisingly flowed naturally between the Hip-Hop legend and me, the upcoming poet. I showed him the respect he deserved which I think he appreciated. We live in a time where many a young artists neglect the forefathers and forbearers of Hip-Hop, i.e. those who laid down the path that these young artists themselves now walk freely. Many of these artists are oblivious to who the legends are, and the years these figures spent in the game, at a time where Hip-Hop was given no ethos in popular culture. I guess I must’ve stood apart from them to Lord J in some way because he also showed me love and agreed to participate in a song which was ironically aimed at the very concept of identity which he’d been speaking up for, for years. It was almost as if the song was meant to be. We began and ended the conversation with the word “Peace”, and a week later I had lyrical gold sent to me as an e-mail attachment. I called up my boy, fellow Brand Nubian fan, Hakim, who always plays the role of the laidback cool kid in the back of the room… but even he was noticeably ‘juiced’ as I leaked the news. “I just got a feature from Lord J,” I said. Now I’ve been in the booth with E-40; and on my first solo I worked with Raekwon, Canibus, Sadat X, Hussein Fatal and Killah Priest, and since then other legends, as well as contemporary heavyweights. However this song and its message along with the person featured on it, held special weight. It meant and still means something special. 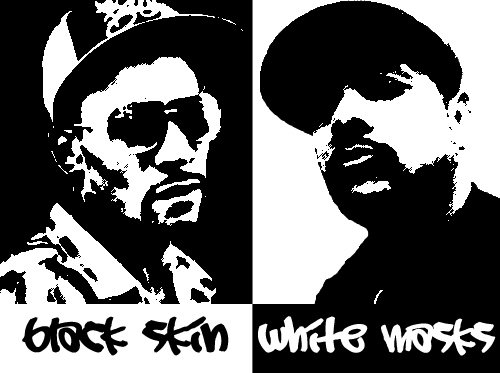 This ‘feature’ meant an almost perfect marriage or Lord J’s appearance to the lyrical content to the custom beat made by Arun Trax which used a vocal sample from the late Khalid Abdul Muhammad; in addition to top it all off, the song itself was titled after the seminal work of Frantz Fanon, White Skin, Black Masks. The song was meant to be both a history lesson regarding people of dark skin or African descent in the West as well as a wake-up call to many of what Hip-Hop had been and could still be: message driven music. So for the backdrop for this song, my team shoes an appropriate video, the infamous ‘Black Sambo’ by Warner Brothers; a ‘banned cartoon’ because it depicts in the most heinous of ways a child of black descent in such a negative light. It spoke to the essence of the song and seemed almost tailor made to convey the lyrical message which ironically speaking to issues that sadly still exist in society today. Another layer of irony is that it was images like ‘Back Sambo’ which reinforced in the minds of many black and other children of color growing up a sense of inferiority. These children then grew up to wear ‘white’ masks to move forward in society. Hip-Hop is a way of communication positive messages and it gives voice to the voiceless. However those that say Hip-Hop is dead say so because it has become a co-opted art form in becoming an almost self-deprecating form of expression especially as it is packaged in its erudite now popular form—I would argue that in this sense while Hip-Hop seams ‘dead’ to its message driven roots, the message does live on. Hip-Hop is alive overseas; it lives in basements, in backpacks, in taped up headphones worn by street urchins, in cyphers comprised of orphans, and in vocal booth microphones that embrace the spit of authentic stories which are often ignored by popular media. Hip-Hop lives in large part to the continued investment of those who have laid the path like Lord J.
Lord J, gains nothing from our collaboration—instead he builds and gives back, he allows the spotlight that has embraced his years of work to shine ever so briefly on an up and comer like myself. PEACE, Lord Jamar, thanks for doing this young up and comer a solid on this joint. I was honored that you would consider it in the first place. While the song may not have a mass audience, it speaks to issues that continue to affect the masses. PEACE, Professor A.L.I. Keep Hip-Hop Alive watch the video here and support the song and album Carbon Cycle Diaries on iTunes.